On the morning of 7 December 1941 two Signal Corps privates were operating a mobile air warning set at Opana in the island of Oahu. At 0702 they picked up on the radar screen a large flight of aircraft approaching from the north. They tracked the planes in from 130 miles only to lose them as they neared the coast. At 0755 the planes, soon identified as Japanese, launched simultaneous attacks against Pearl Harbor and Hickam Field. Four days later Germany and Italy joined their Axis partner by declaring war against the United States. The war ended, as it had begun, with an air attack--a single atom bomb loosed from a B-29 over Nagasaki on 9 August 1945. Between those two bombardment missions the Axis powers had been decisively defeated by the combined arms of the several United Nations. This is a history of the United States Army Air Forces in that war. The present volume carriers the story to the end of the summer of 1942. The history does not begin with the abruptness of the surprise attack on Pearl Harbor. A more leisurely approach may lessen the drama of that Sunday morning but will make more intelligible the course of the war which followed. came, preparations were far from complete, and for months the United States fought on the defensive, pushed about by the Japanese in the Pacific and harried by German U-boats in the Atlantic. Before a year had run out, though, production and training programs initiated earlier were sufficiently advanced to support limited offensives in both the European and Pacific theaters. The history of the Army air arm during the period 1917-41 reflects, sometimes in exaggerated form, the general pattern set by the nation's military policies. Created virtually from whole cloth in 1917, the Air Service experienced a vast but tardy expansion. After a few months of combat in France came peace and, in 1919, rapid and thorough demobilization. Twenty lean years followed. National policy, in the interests of world peace and domestic economy, opposed a large and expensive military establishment; the air arm, s a junior member of the military team, suffered from lack of funds and personnel and enjoyed little control over its own fortunes. The period was not wholly sterile, however, and, when in 19 nation began again to gird for war, the expansion of the Air Corps was along lines conditioned by the experiences of two decades of peace a well as by those of World War I. And so, while the present volume deals largely with the air war which began at Pearl Harbor and Hickam Field, the operational narrative is prefaced by a brief account of the development of the Army's air organization in the quarter-century which followed the establishment in 1914 of the Aviation Section, Signal Corps, and by a more detailed description of the efforts made in 1939-41 to prepare the air force for war. the attitudes and convictions of the Army's airmen on the eve of their second war. The story of the Army air arm in World War I was one of promise rather than of achievement. The combat record was excellent, but brief and on a scale far more modest than the public had been led to expect. This explains why most of the official reports of the Air Service's war activities were compounded of statistics and apology. There is now little cause to wonder at the failure to make good the brave promises of 1917--indeed, but for their extravagance, the feebleness of the air effort might have received far less public criticism, in order to secure support for unprecedented appropriations, those in charge of military aviation, civilians and officers alike, made rash predictions. Probably their claims were inspired by inexperience rather than by an outright lack of candor, but they were wholly unwarranted; and, when the failure of the program became a matter of common knowledge, reaction was bitter. Reorganization was swift and effective, and, had the war dragged on into 1919, the boasts might have been made good, if somewhat tardily. the British and French war missions to Washington, before any decision had been made a to what the American war contribution should be. Few in the United States as yet envisaged an expeditionary force of millions of men, and it is possible that the French, gauging the public attitude shrewdly, thought it easier to sell the idea of a war of machines.3 Certainly the deployment in France of a force of 4,500 combat planes would have entailed a more lavish use of aviation than had yet been employed in the close support of ground armies. The new program, which immediately supplanted earlier modest estimates, called for an appropriation of $640,000,000. The necessary legislation was pushed rapidly through Congress in the Aviation Act of 24 July 1917. The bill was passed without roll call--also without concurrence by the Army's general Staff, having been borne on a wave of public enthusiasm engendered by a high-powered publicity campaign. Slogans such as the "cloud of planes" and the "million roads to Berlin" became in anticipation concrete realities. Inspired news stories and editorials played on the speed and economy of life with which aviation could turn the scales against Germany; the capacity of America to fulfill the production, training, and tactical requirements was seldom doubted.4 As the New York Times put it editorially: "By no other means can we so quickly or so surely render valuable aid to our allies. . . . Airplanes can be rapidly built. . . . Money is all that is lacking. "5 A few experts thought differently, though rarely for publication: that "no amount of money will buy time. Even the most generous preparations do not open up the years that have passed and enable us to carefully lay the foundations of a great industry and a great aerial army. "6 Experience was to show the wisdom of this view. Nor was there in existence an aircraft industry which could remedy the deficiency. 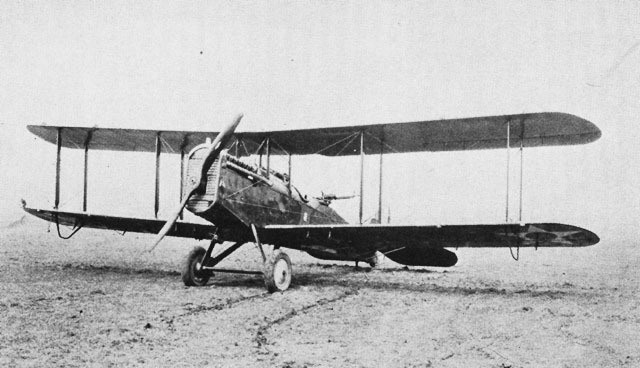 About a dozen companies were considered capable of filling government contracts, but their output was pitifully meager; in 1916 nine factories had contributed to the delivery of 64 planes out of 366 ordered.11 Because of exaggerated ideas of security and the rapid changes in combat models, the Allies had not turned to American industry for aircraft as they had for other munitions. Few Americans had seen a modern tactical plane; fewer still knew what went into its construction other than airframe and engine. war, adverse rumors began to be noised about. Rumors were followed by disclosures, disclosures by congressional and presidential investigations. In the spring it became obvious that, in spite of the patent falsity of charges of graft and sabotage, the program was failing; the huge cloud of planes which was to have darkened German skies by June was as yet hardly larger than a man's hand. Actually the first U.S.-built DH-4 with Liberty engine was shipped from Hoboken on 15 March and was airborne in France on 17 May, two months after the great German offensive had been launched.18 In the meanwhile, the widely advertised threat of American air power had spurred German plane production; the enemy sardonically dubbed his intensified efforts of 1917 the Amerikaprogramm. Disillusionment in the United States was painful, but it brought speedy reform. With legislative authority granted by the Overman Act of 20 May 1918, President Wilson by executive order removed Army aviation from the jurisdiction of the Signal Corps. Responsibilities for training and operations were vested in a Director of Military Aeronautics (Maj. Gen. William L. Kenly). A new executive agency, the Bureau of Aircraft Production, was "to exercise full and exclusive jurisdiction and control over production of aeroplanes, engines, and aircraft equipment" for the Army; the bureau was connected with the Aircraft Board by interlocking membership. The new organization was soon officially recognized as the Air Service, U.S. Army; but, inasmuch as its two components reported separately to the Secretary of War, there was in reality no common policy for the makers and users of planes. This functional duality was long to plague the Army air arm; for the time bit was mitigated by the appointment on 27 August of the civilian head of the Bureau of Aircraft Production, Mr. John D. Ryan, as Director of Air Service (over both phases of aviation) and as Second Assistant Secretary of War.19 The latter appointment was a move in the direction of separate cabinet representation for air, a measure which had been previously suggested in Congress and which was proving successful in England. But the arrangement was only a wartime expedient which recognized a cleavage within the War Department without providing a permanent solution for the problems involved. from the several official sources are difficult to reconcile, but a fair estimate might include about 7,800 trainers and 3,500 service planes, largely DH-4s, built in U.S. factories by 11 November 1918, and 5,000 planes bought abroad.20 At that date 499 DH-4s were assigned to squadrons at the front 2,925 planes reaching the AEF's Zone of Advance during the war, only 696 were of American make. perhaps about 30,000 service and training engines were produced. The rate of production was rapidly accelerating at the end of the war, standing then at 260 DH-4s per week, or about 13,500 per year.21 Six months more of war might have seen an Army air force such as had been promised in June 1917; but actually the regiments and brigades of winged cavalry mounted on gas driven flying horses" never arrived to "sweep the Germans from the sky." and on a unified air command.34 Mitchell's respect for Trenchard was significant, for it was to be British rather than French concepts which were to guide his own development and, through him, were to affect American doctrines of air warfare. Mitchell's active curiosity drove him to study the logistical and administrative foundations of air power. Within a few weeks of his arrival in France he had, on his own initiative and with French aid, drawn up and submitted to the War Department a detailed plan for the organization of an AEF air force. Receiving no reply to his recommendations, Mitchell had turned to the French government as an effective channel for his ideas and, according to his own statement, had been largely responsible for Ribot's cable of 24 May which launched the U.S. aviation program on so ambitious a scale.35 More to his liking, however, was his service at the front, where his colorful personality and exploits soon made him a legendary figure. 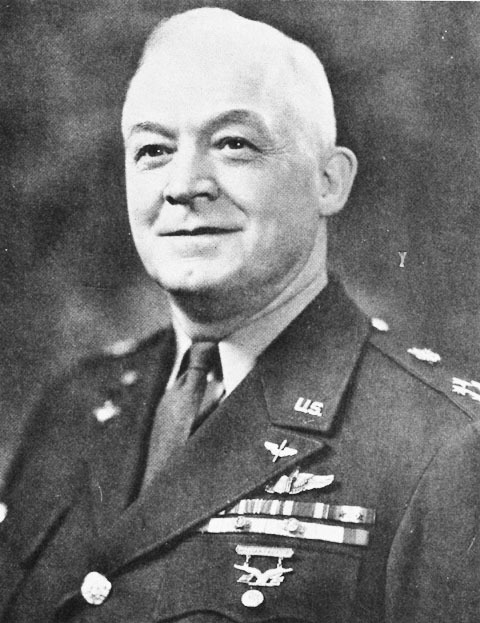 In the rapid shifting of commands that was characteristic of the AEF, he served successively as commander of Air Service for the Zone of Advance, the I Corps, the First Army, and the First Army Group, advancing in grade from major to brigadier general. Mitchell never received an American air force commensurate with the ambitious ideas of air power which he was developing, but he tested those ideas with such units as were put at his disposal. American aviators were fed into quiet sectors in April 1918m, achieving their first individual victory on the 14th. The Air Service had its initial lesson in the use of organized air units in July in a sharp engagement during the battle of Château-Thierry. Throughout the war some squadrons fought with the British or French; for those under U.S. command much of the air action consisted of routine reconnaissance and patrol duty.37 In two battles the force under Mitchell's command was powerful enough to indicate something of his imagination and tactical skill. himself and a small staff, called for a tremendous force of 1,500 planes--the largest air show of the whole war. Of the 1,481 actually engaged, only 609 were from American squadrons, the remainder being made up of aircraft from the RAF's Independent Force, the whole of the French Air Division (strategic reserve), and Italian and Portuguese units. Preparations for so large a battle could not be hidden completely, but a certain degree of tactical surprise was achieved. only about a third of the aircraft were attached to the ground forces. The rest, divided into two air brigades, struck alternately at the right and left flanks of the salient and at communications and supplies at the rear. Local air superiority was maintained according to plan throughout the battle, and the air component contributed effectively to the American victory in spite of unfavorable weather.38 Mitchell's skill in marshaling and controlling so large and heterogeneous a force was surprising; in short, St.-Mihiel was as promising a debut for the Air Service as for the First Army. In the more extended Meuse-Argonne offensive of 26 September-11 November, Mitchell was unable to rally so large a force, being usually dependent upon American units only. The principle of concentration which had been so successful at St.-Mihiel continued, however, to guide his tactics. In the Meuse-Argonne it was the Americans who occupied the salient and the German air force which struck at the flanks, trying, in Mitchell's words, to "make our infantry insist on splitting up our pursuit aviation so as to give local protection everywhere." Mitchell refused to "spread a thin veneer of airplanes all along the front through which they could break easily at any point with a large group formation." To intercept German "battle squadrons" of attack planes, the Americans organized a special branch of their forces known as "low-flying pursuit." Patrols of five planes each were assigned ten-kilometer fronts. Flying at two levels and using friendly antiaircraft fire to spot enemy intruders, the patrols proved successful in breaking up their attacks on ground troops. fight at a disadvantage. One day mission was sufficiently large and successful to draw more than passing attention. On 9 October, with some French reinforcements, Mitchell was able to employ a force of about 200 bombers escorted by some 110 pursuits and to three-place planes. With these he attacked and disorganized German army reserves gathering in the rear for a counterattack. The German air defense was overwhelmed, and the area bombed with telling effect. Thirty-two tons of bombs were dropped in this mission; subsequent operations during the same day and the following night brought the total for twenty-four hours to sixty-nine tons.39 It was probably the Air Service's most notable bombardment effort during the war. When war ended, the Air Service had not begun such attacks. Their total "rain of bombs" for the war was about 138 tons--or, to use the more impressive figure of the official report 275,000 pounds. Their deepest penetration behind German lines was 160 miles.41 Even by the correspondent's own definition the attack of 9 October was hardly an independent mission. The sudden collapse of Germany made him a false prophet, but his predictions were better grounded than those of early 1917. On 6 June 1918 the RAF's Independent Force had been established with its commander, Trenchard, directly responsible to the Air Ministry. Its mission was strategic bombardment--in Germany when possible--and its operations had slowly mounted in intensity. The principle behind this organization had been grudgingly accepted by the French, and on 3 October the constitution of an Inter-Allied Independent Air Force, also directed by Trenchard but "under the Supreme Command of Marshal Foch for operation," had been agreed upon.42 The Air Service was to have participated in this combined force, which was still a paper organization when the Armistice came. Early in 1918 the Air Service, AEF, had entered into an arrangement with the British for the combined production of the large Handley-Page night bomber and the training of U.S. crews for its employment. This project, like so many others, had lagged, and the Air Service was never equipped during the war with aircraft specifically designed for strategic bombardment.43 Again, the deficiency might have been overcome in 1919. Had the war lasted long enough to provide the Air Service with some experience in a bombardment program conceived independently of the movements of ground armies, its postwar history might have been far different. For in the interim between the two wars the relative importance of such an air mission became the crucial issue in the development of air power. Advocates of an air force tied closely to ground troops could speak authoritatively from experience; Americans who talked independent air operations could cite only theories. But in 1943 the correspondent's dream was to be fulfilled almost to the letter. 1 Howard E. Coffin, quoted in New York Times, 14 June 1917. 2 A.W. Sweetser, The America Air Service (New York, 1919), pp. 66-68. 5 New York Times, 10 June 1917. 6 Dr. C.D. Walcott of NACA, quoted in Sweetser, op. cit., p. 45. 7 E.S. Gorrell, The Measure of America's World War Aeronautical Effort (Northfield, Vt., 1940), p. 2. 8 Sweetser, op. cit., p. 16. 9 G.W. Mixter and H.H. Emmons, U.S. Army Aircraft Production Facts (Washington, 1919), p. 5. 10 J.J. Pershing, My Experiences in the World War (New York, 1931), I, 27. 11 Sweetser, op. cit., p. 46. 12 Ibid., p. 54; Mixter and Emmons, op. cit., p. 5. 13 J.M. Spaight, The Beginnings of Organized Air Power: A Historical Study (London, 1927), p. 239. 14 Sweetser, op. cit., p. 93, n. 1, quoting the legislation. 15 Spaight, op. cit., pp. 238-45, based largely on Sweetser. 16 Sweetser, op. cit., pp. 190 ff. 17 Ibid., chaps. vi and vii. 19 Ibid., pp. 218-19, 238; Spaight, op. cit., pp. 246-51. 20 Sweetser, op. cit., pp. 220 ff. 21 Ibid., pp. 24, 247-48; Spaight, op. cit., pp. 279-88, summarizes statistics from various sources. 22 Sweetser, op. cit., pp 232-33. 23 Pershing, op. cit., I, 161-62. 24 M.M. Patrick, The United States in the Air (New York, 1928), p. 15. 25 H.A. Toulmin, Jr., Air Service, A.E.F., 1918 (New York, 1927), pp. 74-78. 26 Patrick, op. cit., p. 16. 27 Gorrell, op. cit., p. 29 (table); Pershing, op. cit., II, 61. 28 Patrick, op. cit., pp. 1-16; Toulmin, op. cit., chap. vi. 29 Patrick, op. cit., p. 17. Here he gives the previous goal as 354 squadrons. 30 Gorrell, op. cit., p. 29. 31 Final report of Chief of Air Service, A.E.F. (Washington, 1921). 32 Details in this section are taken from the best of the Mitchell biographies: Isaac Don Levine, Mitchell, Pioneer of Air Power (New York, 1943). 33 For quotations see ibid., 92-94. 37 Final Report . . ., A.E.F., passim. Another summary of the participation of American air units in the war will be found in [Clayton L. Bissell] Brief History of the Air Corps and Its Late Development (Air Corps Tactical School, Langley Field, Va., ), pp. 33-65. 38 William Mitchell, "The Air Service at St. Mihiel," World's Work XXXVIII (Aug., 1919), 360-70; Final Report . . . , A.E.F. 39 Quotations and general concept of the battle taken from William Mitchell, "The Air Service at the Argonne-Meuse," World's Work, XXXVIII (Sept. 1919), 552-60; Final Report . . ., A.E.F. 40 Quoted in Special AAF Historical Study, Review of Aerial Warfare for the Scientific Advisory Board (Jan. 1945), p. 3. 41 Final Report . . ., A.E.F. 42 H.A. Jones, The War in the Air, VI (Oxford, 1937), 1-27, 101-17, and the pertinent documents in the appendices, especially on p. 41. 43 Toulmin, op. cit., chap. xv.